The Stoop Storytelling Series is a Baltimore-based live show and podcast that features “ordinary” people sharing the extraordinary, true tales of their lives. The mission of The Stoop is to build community through the sharing of personal stories. Stoop shows are intimate and surprising, wonderful and weird, hilarious and heartbreaking. Since its founding in 2006, The Stoop has featured the tales of more than 2,500 people onstage, including notable citizens such as Congressman Elijah Cummings, “Wire” creator David Simon, activist DeRay Mckesson and Senator Barbara Mikulski -- and been featured in The Washington Post and New York Times. 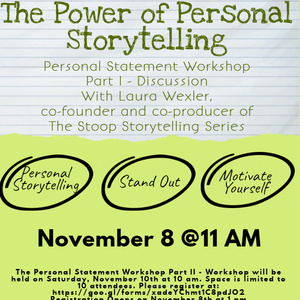 The Stoop also offers storytelling workshops and special events. Learn more and listen to stories at stoopstorytelling.com. In this lively lecture and discussion, participants will enhance their understanding of true, personal storytelling as a powerful tool of communication and learn its basic principles. Participants will leave empowered to begin crafting a 5-minute true, personal tale that shares their motivations for pursuing a scientific career.